The ISPF Productivity Tool functionality is available from any panel without modifying any ISPF Primary Option Menus. All ISPF-PT functions are totally integrated. ISPF-PT can perform almost any activity within ISPF or internally invoke the function that can perform the task. The ISPF Productivity Tool combines separately provided ISPF utility functions and new ISPF Productivity Tool features into the Object List (OLIST) and Member Selection List (MSL). The resulting member, data set, and object lists become powerful platforms where you can perform many tasks without navigating to other utilities. 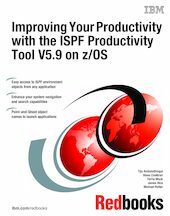 The ISPF Productivity Tool relates objects to applications similarly to the way a PC performs Object Linking and Embedding (OLE). By extending the data-set objects that ISPF uses to other object classes, ISPF-PT lets you specify the object to be processed and the action that is performed (such as EDIT or BROWSE). The facility appropriate to the object class for the action you have requested is invoked automatically. The ISPF Productivity Tool provides extensive search capabilities that are both rapid and intuitive. You can easily search for volumes, data sets, members, and text within members. The ISPF Productivity Tool also furnishes automatic drill-down system navigation to examine volumes, data sets, and members. The ISPF Productivity Tool extends the ISPF Action Bar with options that provide access to new functionality so that you do not have to learn new commands or syntax. In addition to the ISPF point-and-shoot capabilities, the ISPF Productivity Tool provides new concepts, such as Hotbars (user-defined fields that execute commands), field-sensitive areas in MSLs and OLISTs, automatic recognition of a data set name on any ISPF panel as a parameter to BROWSE, EDIT, VIEW, or parameters within any Time Sharing Option (TSO) command. The ISPF Productivity Tool provides integrated and enhanced IBM Software Configuration and Library Manager (SCLM) support within the standard member and data set lists. SCLM is a source library management component of ISPF that provides change control, multiple source versions, auditing, a built-in make facility, and automatic check-in and sign-out using standard libraries (Partitioned Data Sets (PDS) and (PDSE) Partitioned Data Set Extended). The ISPF Productivity Tool includes built-in interfaces to various IBM and ISV products. This book is intended as a supplement to existing product manuals. We start with an overview of the main ISPF-PT concepts and facilities. Next are detailed chapters, each dedicated to a major ISPF-PT function, such as: Object-Lists, Member-Selection-Lists, enhanced Point-and-Shoot, EDIT CUT and PASTE, ISPF-PT with IBM File Manager, ISPF-PT with IBM SCLM, TSO Shell, ISPF-PT installation and customization, and an example of implementing an ISPF-PT User-Defined-Object-List. A set of appendixes explore deeper into selected topics. Practical scenarios, accompanied by detailed screen captures and coding examples, demonstrate how to take advantage of the ISPF-PT enhanced functionality at every case.